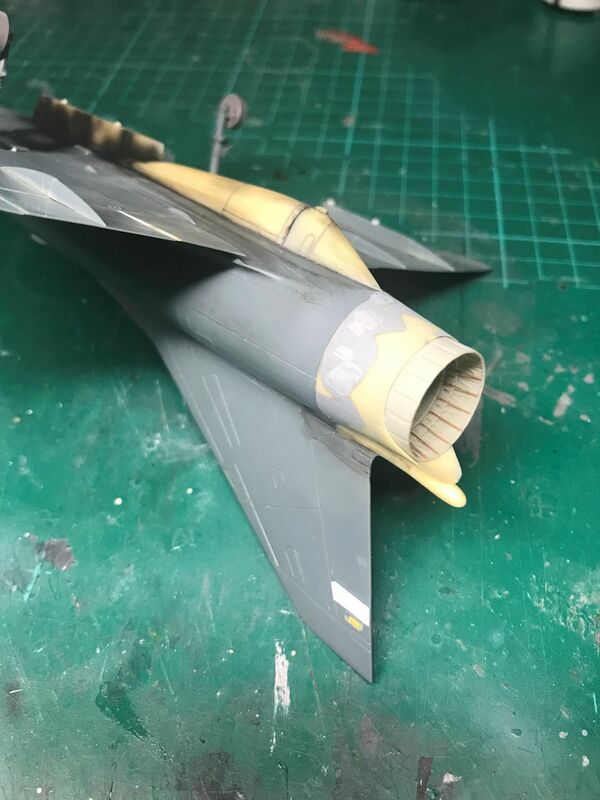 Nose section in place with Master Models brass pitot fitted. The recon jet had no gun port openings. These were filled with Tamiya Light Curing Putty and sanded smooth. The AML resin cable ducts and lower rectangular camera fairing were also glued in place. Note that the rear camera box part needs to be off centre, not centred as the AML instructions show. 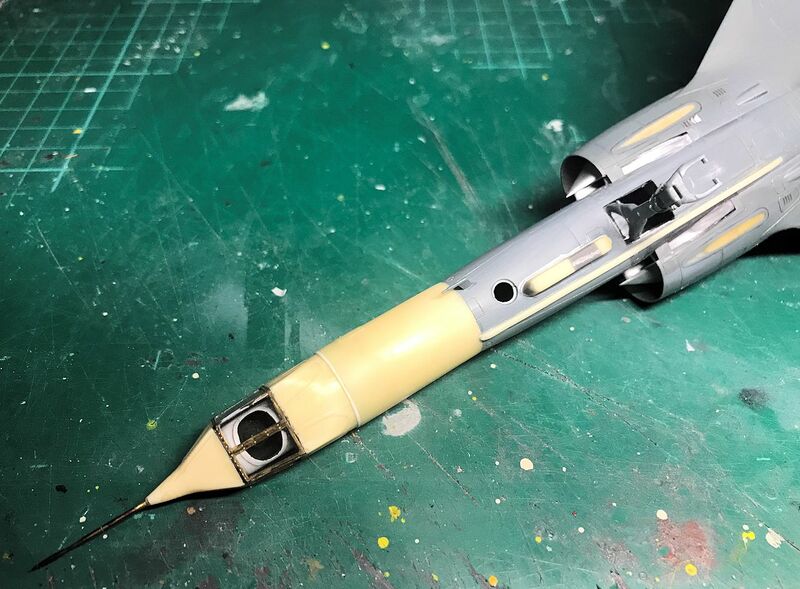 Nose gear fork angle has been significantly reduced, and the gear leg shortened, as Eduard had moulded it as it would appear with weight off the wheels. IsraCast Kfir centreline pylon in place and AML ventral fuel tank part underneath. Holes filled for inner pylons. 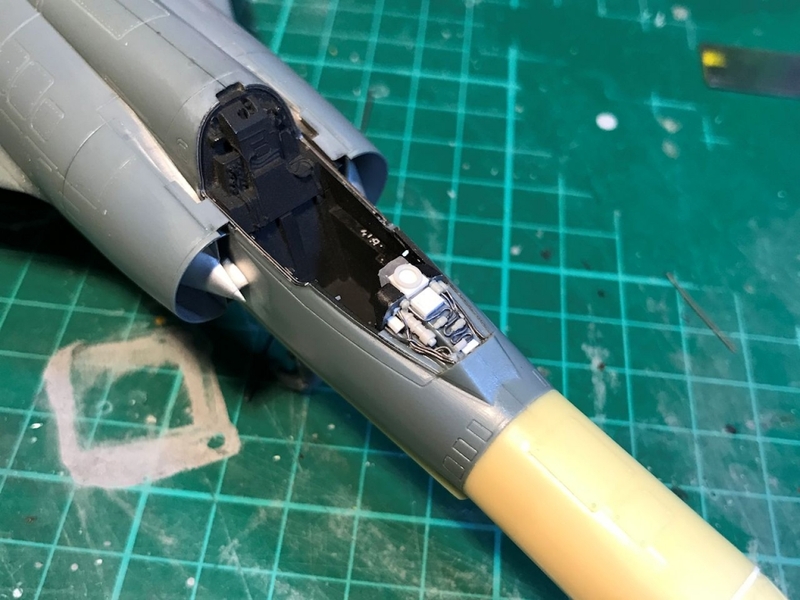 I have also reduced the height of the main landing gear by 3mm as Eduard seem to have measured the aircraft when it was on jacks. 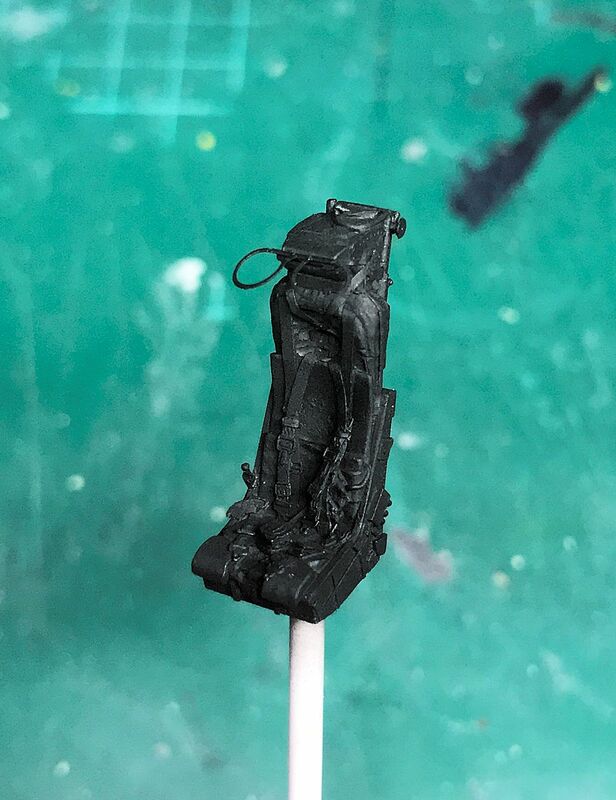 The corrected gear gives a better sit to the model. 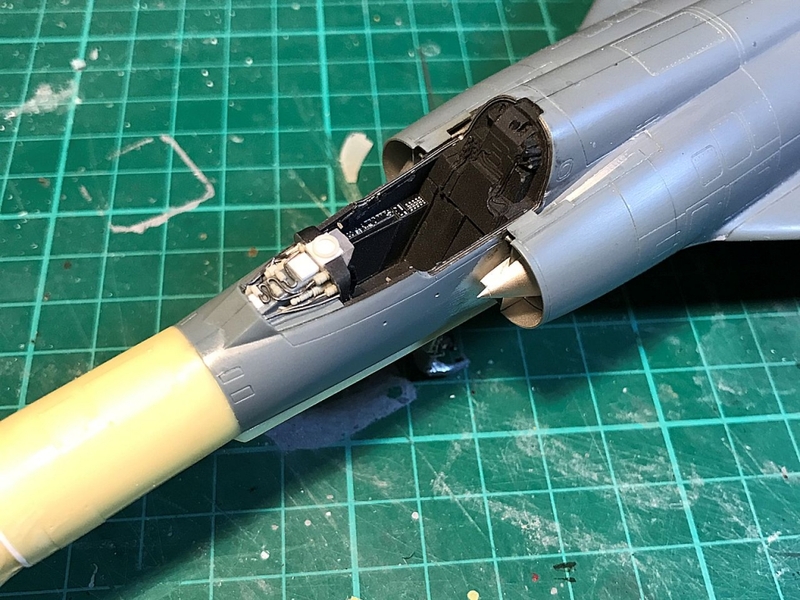 I also glued closed the large main gear doors and the large nose gear door. These doors can be open or closed on the ground, as they cycle closed on landing once the gear is down, but may be opened by ground crew for servicing/checks. 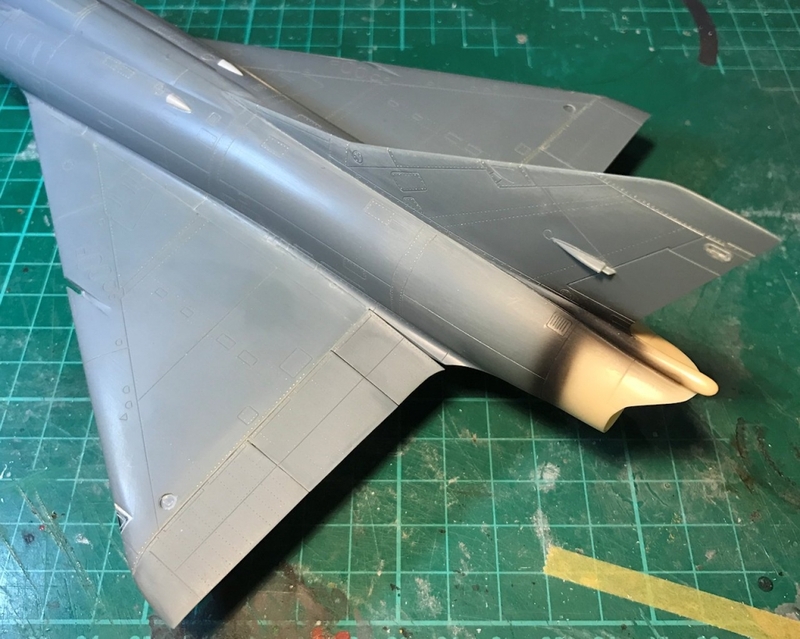 By closing them it gives me less masking and painting to do and cleans up the lines of what is still a very sleek aircraft, in spite of its huge nose. I needed to rescribe most of the panel lines on the ventral fuel tank as they were crooked. The small black opening at the back will be glazed with some form of liquid glass to form a window when painting is complete. 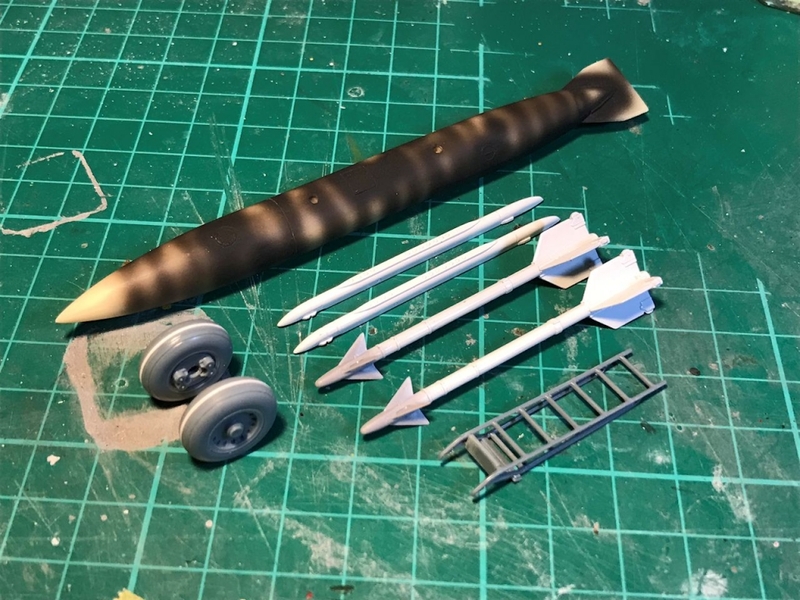 Modified the kit missile pylons by cutting off the launch rails and adding the small styrene spacers to keep the launcher rails away from the pylon as per reference pics. ArmyCast ATAR 9C rear fuselage piece in place. 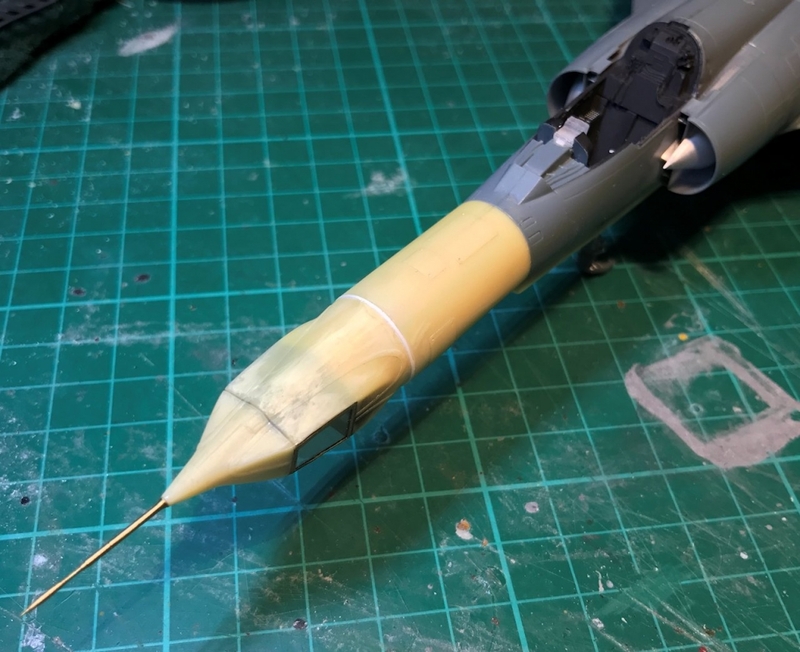 Took quite a bit of sanding of the Eduard fuselage to get them to same diameter. Dropped the flaps slightly to show hydralic bleed off. 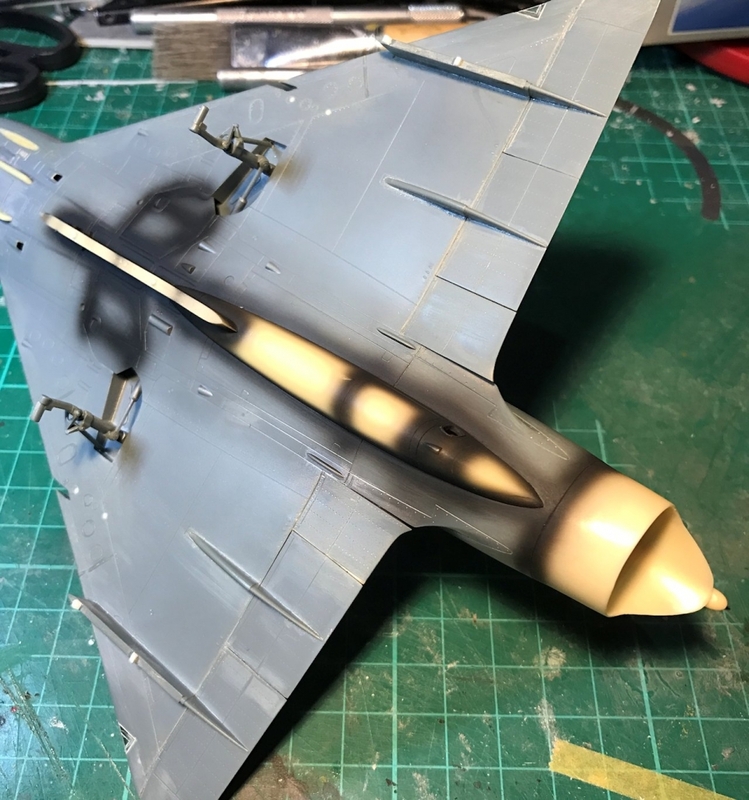 Rescribed most of the right side of the tail fin to get it to match the left. Last edited by Craig Sargent; September 13th, 2018 at 08:39 PM. 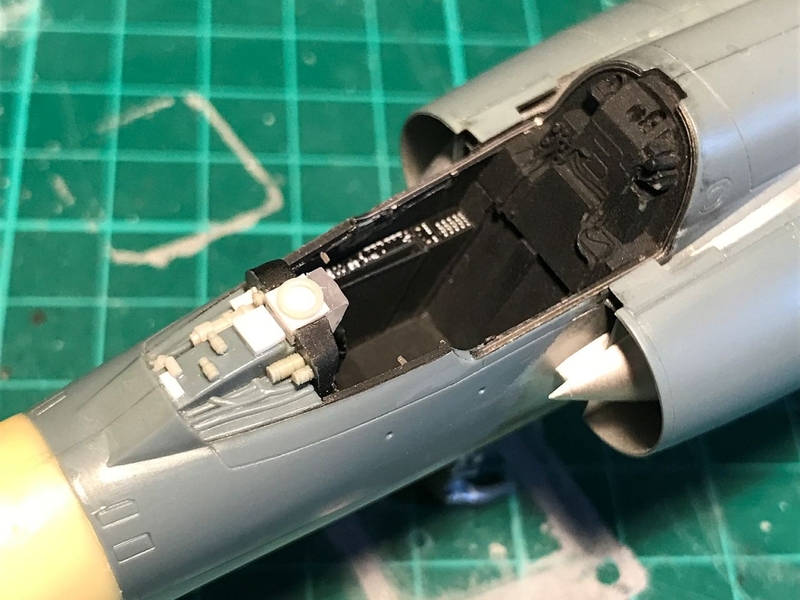 Needed to add some detail to the instrument panel coaming as it is quite prominent and very bare in the kit. Wiring completed and area is ready for paint. 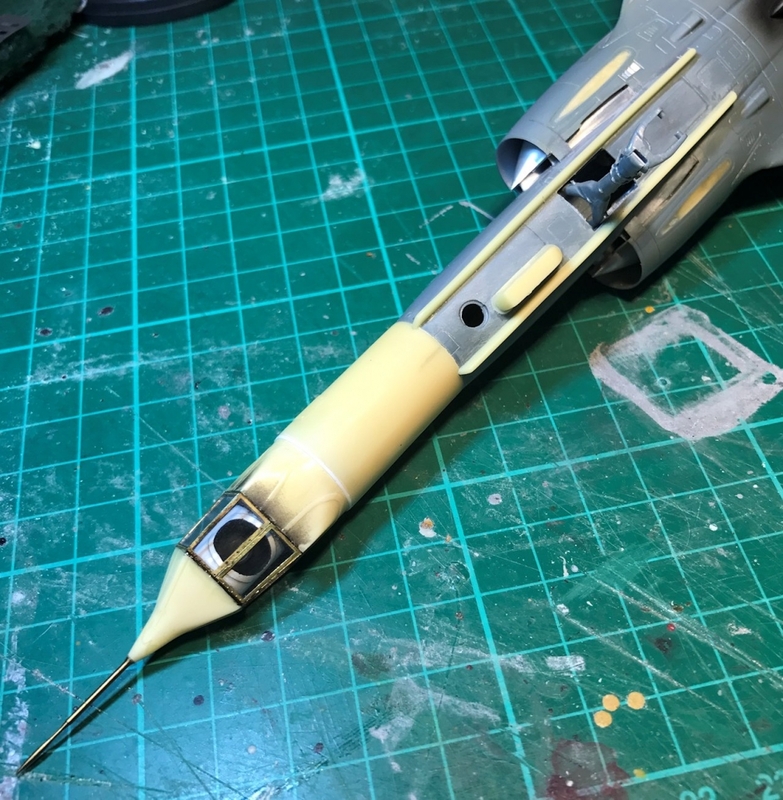 External parts ready for paint. The main wheels have been shimmed to correct the cross section as the kit ones are too anaemic. Centreline drop tank taken from the Isracast Kifr pylons and tanks set. 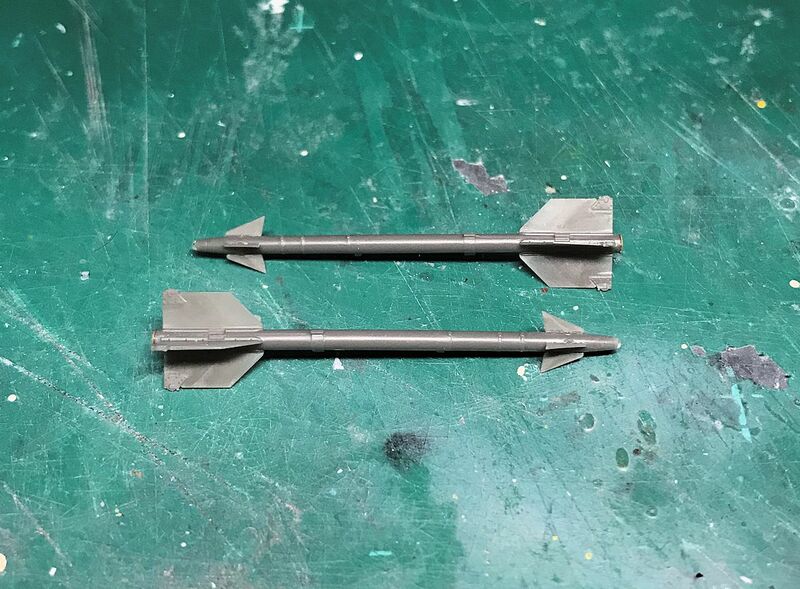 Sidewinder launch rails taken from Hasegawa AV-8B and the AIM-9Ds are Hasegawa, but these will be replaced with some Brassin ones. What a great project...... cant wait to seem more ! Funky looking jet but it really is going to stand out! Excellent! It destroys the beautiful line of the Mirage, making it ugly as ……!! But it also makes it stand out, and the build is looking really nice. You wrote you shortened the landing gear, did you do something extra to strength it? Always thought the Eduard Mirage looked a bit like a ballerina - for the wrong reasons. And your work is always crisp and clean. What an incredible work, Craig! Congratulations. Always thought the Eduard Mirage looked a bit like a ballerina - for the wrong reasons. Like a ballerina? Mind to elaborate on it, Jens? Tip-toeing on it's legs. The kit as is has a little nose-down attitude, so the main gear legs are too long, but I wasn't aware the nose gear is a little long too. Are you kidding me? This is incredible! Can't wait to see more! WOW! Decided it was FINALLY time to kick this one in to touch - I started this 14 years ago, so it is long overdue. I've reworked the underside of the nose based on more recent info on the jet I'm building. 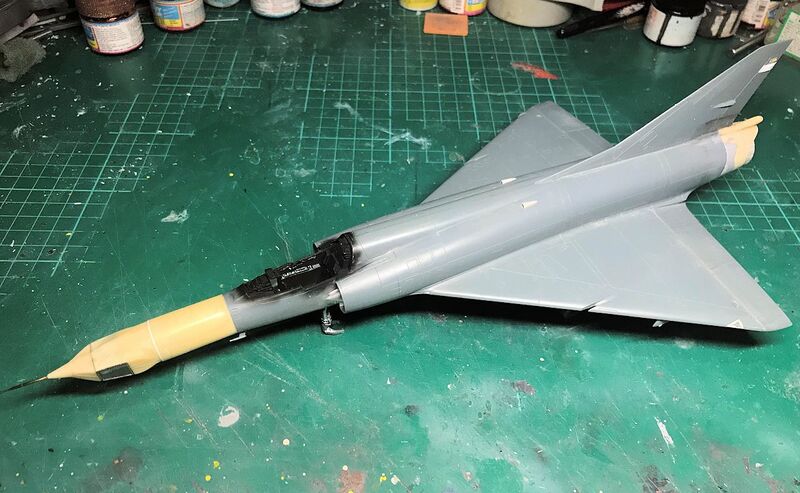 I've also fitted the High Planes exhaust in to the ArmyCast tail cone, added some missing radar warning bulges on the fin above the rudder, assembled and base coated an Aires seat, assembled a pair of Brassin AIM-9Ds and fitted the resin inner wheel disks to the landing gear. Really enjoy this build. Interesting version of a beautiful jet. Keep the updates coming.